American Testament: The Book of Mormon: BookofMormonCentral.org soon to launch! Book of Mormon Central is on the verge of publishing a new online study tool. The aim of the tool is to provide a comprehensive, one-stop shop for Book of Mormon research and scholarship. 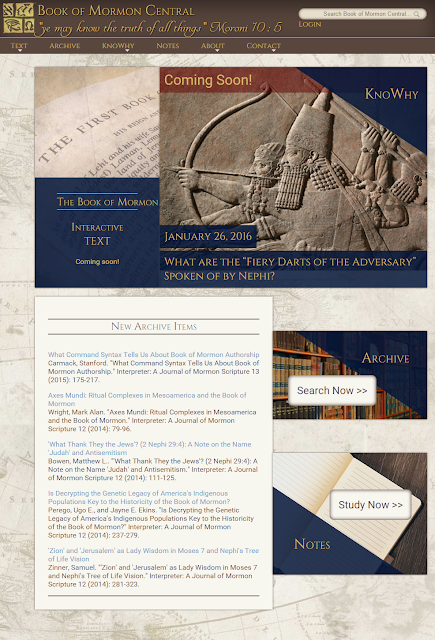 Of particular interest to me is the KnoWhy section, coming in January 2016, which as of this writing seems to be a section devoted to expanding on themes of the Book of Mormon that correlate with ancient literature and biblical and Book of Mormon hermeneutics and exegesis. And, those who have a recollection of the early days of my blog will recognize one Book of Mormon Central contributor, a certain Stephen O. Smoot! Before serving his mission, he contributed a great many erudite and well-written articles here on American Testament under a different profile. I'm glad to see that he's part of Book of Mormon Central, as well as many other scholarly endeavors, and I'm looking forward to quoting and linking to his articles there!